While not a ‘true’ heritage recipe because I switched the mayonnaise with Miracle Whip, I don’t think my grandma would complain. A few summers back I packed up the car to attend a family reunion on my in-laws side of the family. Being late September, the 18 hour leisurely drive up to Cincinnati Ohio was beautiful. From a marina on the Ohio River near downtown, we all boarded my brother in-laws 80 foot Pluckebaum house boat and motored westward down the river out of Ohio. The reunion was actually being held in Indiana on the Ohio River shoreline near the quaint town of Rising Sun. Across the river is gorgeous Kentucky farmland. What a setting for a 100+ person cookout. The beer flowed as freely as the conversation and snacks ranging from deer jerky to homemade chocolates were plentiful. 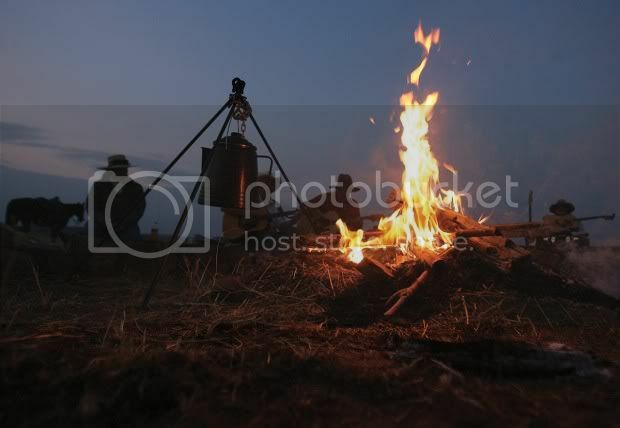 We had arrived at the property around two in the afternoon and the cookout was set for six that evening. Everyone had been asked to bring a covered dish. Now, I know of few dishes that will survive a 4 hour boat ride on top of an 18 hour road trip so using our trail cooking / boat skills, we made up our dish on the houseboat. Now the houseboat has a full sized kitchen in it. I have a hard time calling the kitchen a ‘galley’ as most boats have because a floating house does not in anyway shape or form, resemble a boat. The vessel is not only eighty feet long but eighteen feet wide! That’s longer and much wider than most house trailers. Having stopped at a Kroger’s in Cincinnati, I picked up all the necessary items for the covered dish. Earlier, I mentioned my boating skills. When I had a restaurant in the Florida Keys, I lived there on my boat. I set up the galley so that even when rough weather was up, I could still cook with ease. Cooking in the houseboat was so calm it was like cooking in my house! After I completed my recipe, I kept the finished product right in the stock pot. To chill it down, I slid the pot inside a beverage refrigerator after removing all its shelves. 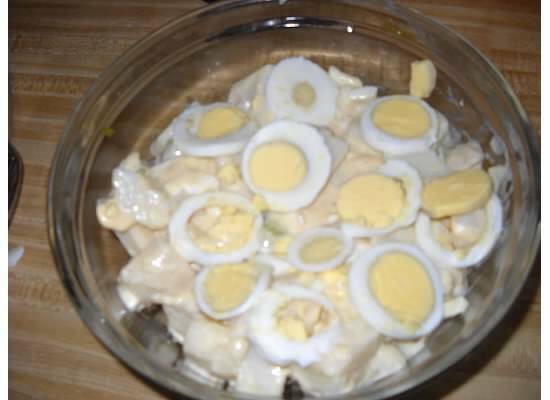 By six o’clock, my covered dish was perfectly chilled and waiting to be devoured. 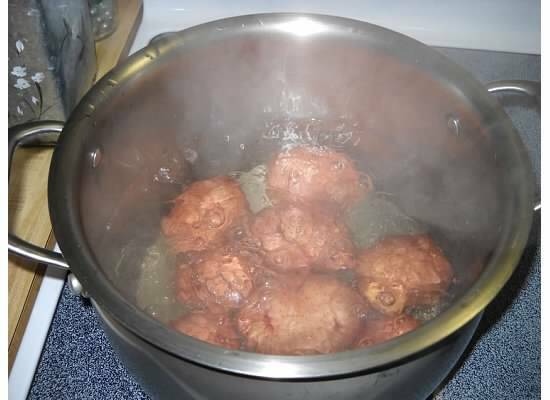 2) Place 4 eggs in a pot of cold water and while uncovered, bring them to a boil. As soon as the water begins to boil, remove the pot from the burner, cover and let stand for 17 minutes. 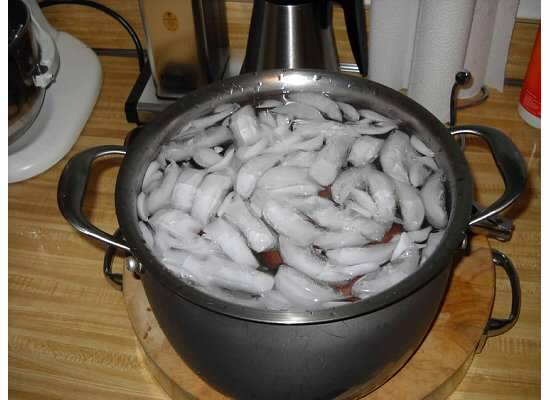 Then pour out water and replace with ice cold water. Let stand for 1 hour. These will now peel quite easily. 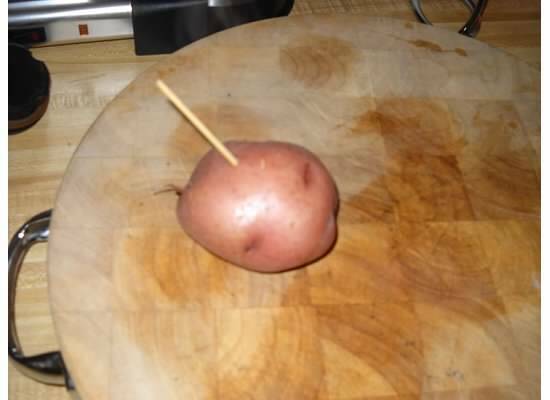 3) When potatoes are thoroughly boiled, test by piercing them. They should offer little resistance to your fork or bamboo stick. 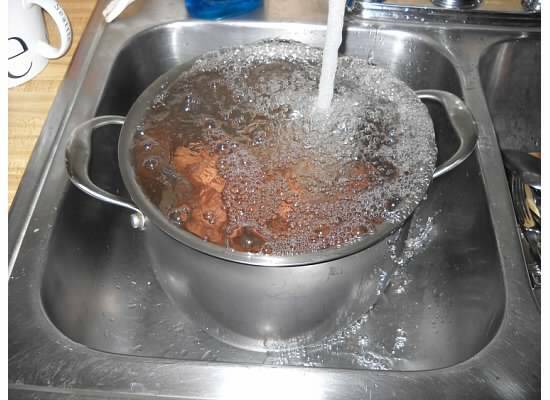 4) Place pot of potatoes under faucet and run cold water for 1 minute, leave it partially filled then pour in ice and set aside for 1 hour. After 1 hour your eggs and potatoes should be well chilled. 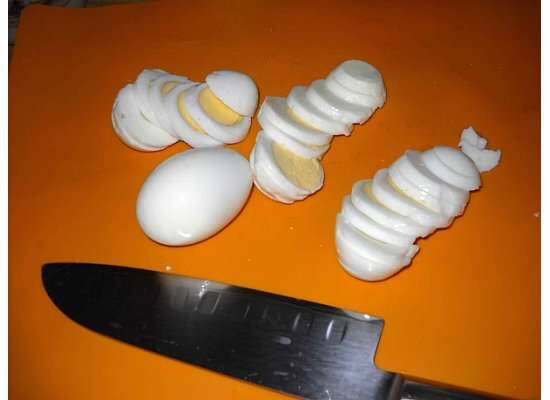 5) When potatoes and eggs are well chilled, peel them. Normally just rubbing the skins will remove the potato skins. 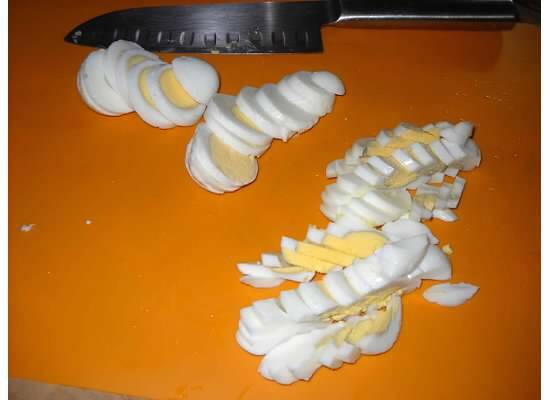 7) Chop into medium pieces the last two eggs and place them into a large bowl. 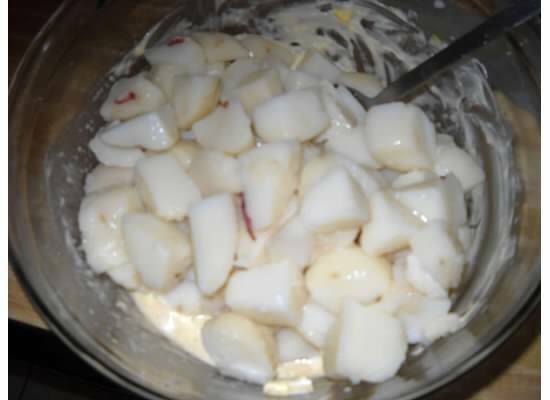 9) Mix all ingredients together then add your potatoes and re mix it until the potatoes are well coated. 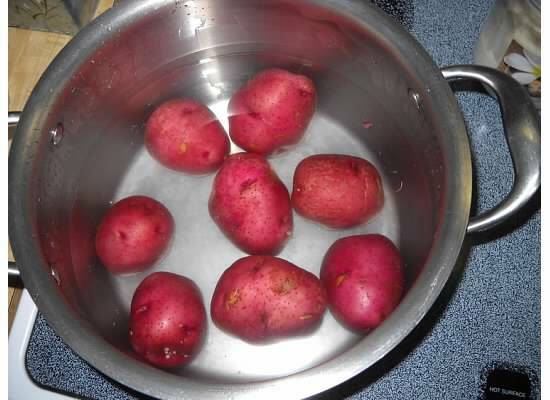 Wash 6-8 Red Potatoes but don’t peel until cooked and chilled. Place 4 eggs in a pan and bring to a boil uncovered. Once it reaches boiling, remove from burner, cover and let stand for 17 minutes. Bring spuds to a boil. until done. To rest doneness. Pierce spud with fork or bamboo stick. I slide mine in on an angle until it reaches past the center. There should be only minor resistance felt. 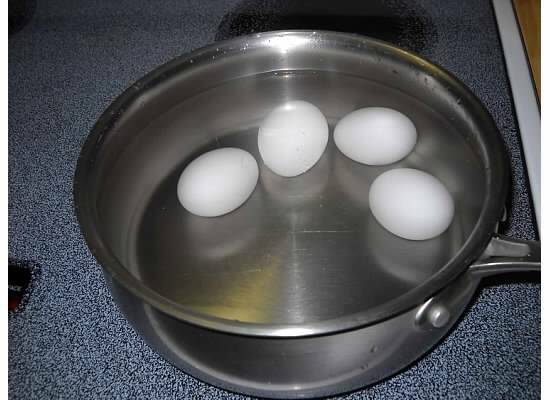 When eggs have sat for 17 minutes, place pan in sink and fill with cold water. 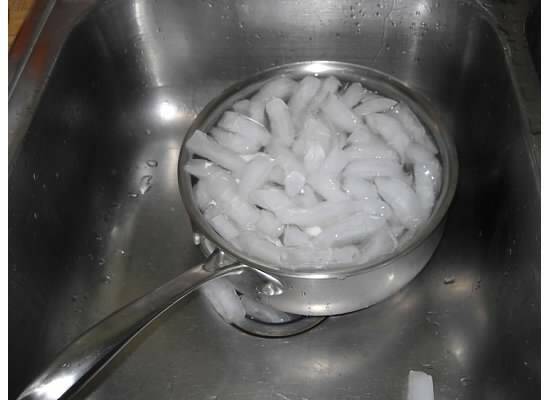 Pour ice in pan top thoroughly chill eggs. When cold, they will easily peel. let eggs and spuds cool for an hour then drain and peel both. 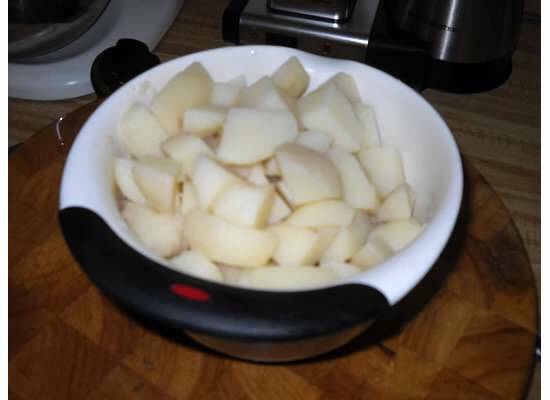 Slice spuds to desired size. Mine are bigger than most folks like… I like the taste of potatoes! Chop two eggs into smaller pieces to mix in with the spuds but leave two in slices for the topping. 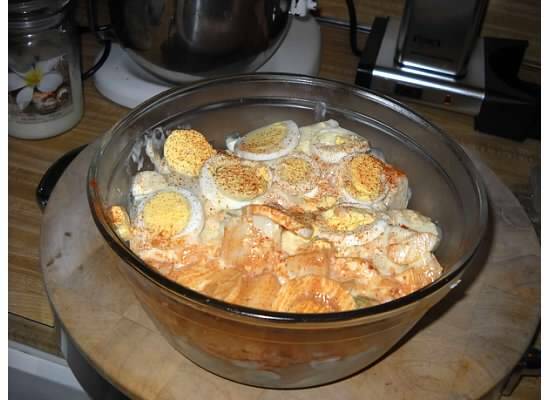 In a bowl, add your ingredients including the chopped up eggs but don’t include the potatoes yet. 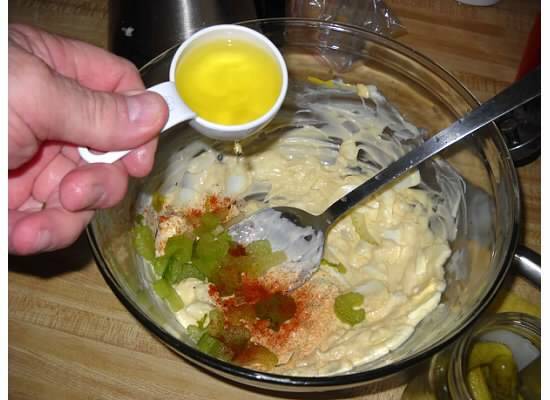 Mix all ingredients into the eggs and celery. 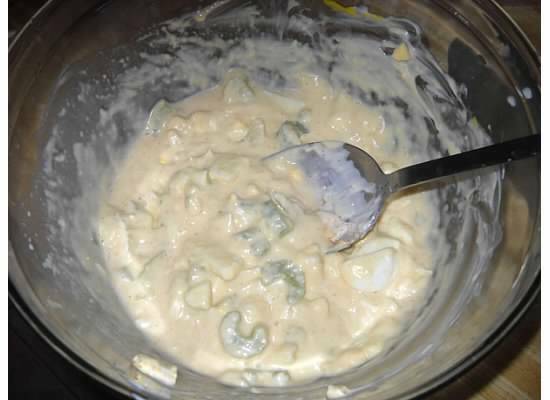 Add your spuds into the egg mix and fold them into the mix until well coated. Decorate the top with the reserved egg slices and sprinkle with a fine layer of paprika. Cover with plastic wrap and refrigerate until ready to eat!